The Park Avenue Lofts for sale are condos built at the very end of the last decade when the word ‘loft’ became a popular idea in a downtown’s urban renewal. It’s an appropriate name because these lofts are certainly within everyone’s definition of downtown, allbeit a small one, and these fit into their surroundings which are generally homes built for short term occupancy, as vacation homes. These delux condominiums range from 1-3 bedroom units and come with private and secure underground parking for homeowners. There are also a few surface spots for visitors for the convenience of Park Avenue Lofts community members. Are you ready to find that perfect condo for sale in Breckenridge? Check out the Park Avenue condominium listings below, or read more about this exclusive community. The location of the Park Avenue Lofts is on one of the ponds, or slow sections, of the Blue River, just around the corner from Main Street on Park Avenue, and next to the public parking called F-lot. Formerly, it was the location of Josh-a’s, a long-running venue that hosted nationally-known acts like Dave Mason, Warren Zevon and Los Lobos. It was the biggest venue in town before the Riverwalk Center was built, and had better sound. 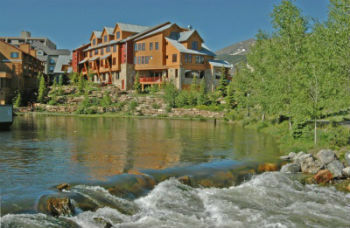 Park Avenue Lofts are across the street from the Village at Breckenridge – several buildings of condos – across whose plaza is the base of the Peak 9 section of the Breckenridge ski resort. These 20 homes are prime property for easy access to skiing and downtown, but also there are many trails that begin at the bottom of the ski mountain for summer time recreation. Amenities: across the street from the Village, and the base of Peak 9 of the Breckenridge Ski Resort, and trails that can be accessed from there into the National Forest. In town, bus stop in front, parking underground, on the Blue River with views toward the ski resort. From the roundabout at the north end of Breckenridge take the Park Avenue exit, which is the continuation of Highway 9 and continue on Park for about a mile until Park Ave prepares to rejoin the traffic coming down Main Street. Park Avenue will be on the left, across the street from the Village at Breckenridge. There are a few surface spots for visitors and underground parking for homeowners. Ready to learn more about Breckenridge real estate? Contact us today online or by calling (970) 453-2200.